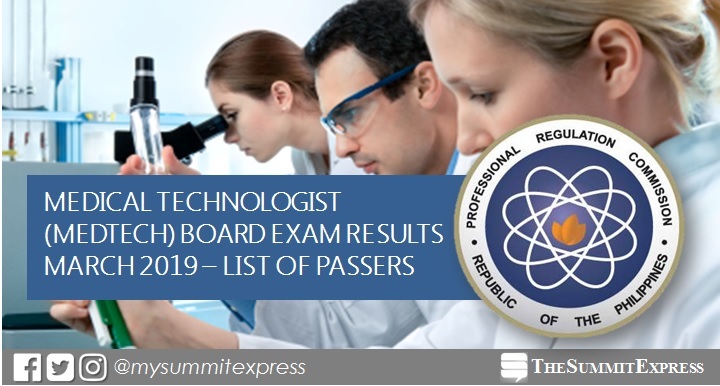 MANILA, Philippines – The March 2019 Medical Technologist (MedTech) board exam results, which include the full list of passers, top 10 (topnotchers), top performing school and performance of schools are available on this page as officially released today, March 19 or in three (3) working days after the exam. As announced, 2,801 out of 4,092 passed the exams. The Professional Regulation Commission (PRC) conducted the first board exam for MedTech this year on March 13 and 14 in the cities of Manila, Baguio, Cagayan De Oro, Cebu, Davao, Iloilo, Tacloban, Tuguegarao and Zamboanga. NOTE: Those who failed to pass the board examination for Medical Technology but had obtained a general rating of at least 70% can register as Medical Laboratory Technician, PRC said. From April 1 to April 12, 2019, registration for the issuance of Professional Identification Card (ID) and Certificate of Registration will be done on-line. Please go to online.prc.gov.ph and follow instructions for initial registration. Medtech board exam's verification of ratings (passers, non-passers and removal) can be done online. Medtech board exam covered the following subjects: clinical chemistry, microbiology and parasitology, clinical microscopy (March 13); hematology, blood banking and serology, hispathologic techniques, cytotechnology, medical technology laws, related laws and its implementing rules and the code of ethics (March 14). According to PRC Resolution No. 1127, the target release of Medical technologist board exam results is on Tuesday, March 19, 2019 or in three (3) working days after the exam. Note that results may be released ahead or on later date without prior notice. We advise takers to monitor announcement of results starting Monday. In the March 2018 Medtech board exam, results were announced in three (3) working days. A total of 2,648 out of 3,644 successfully hurdled the exams. Alvin Aurelia Bahin of Remedios T. Romualdez Medical Foundation topped the board with 90.50%. In the February 2017 exams, results were also out in 3 working days. PRC named 2,378 out of 3,216 who passed the exams. Vanessa Leslie Rivera of Far Eastern University (FEU) - Manila aced the board with 91.20%. Monitor this page for the real-time updates on Medtech board exam results. Check out also the official website of PRC for more information.